Departs daily at 12 pm and 3.15 pm from April to October. Afternoon to avoid the peak hours. We are comparing Pisa Guided Walking Tour Prices from leading ticket suppliers and Try to find you Cheap tickets prices on the market. 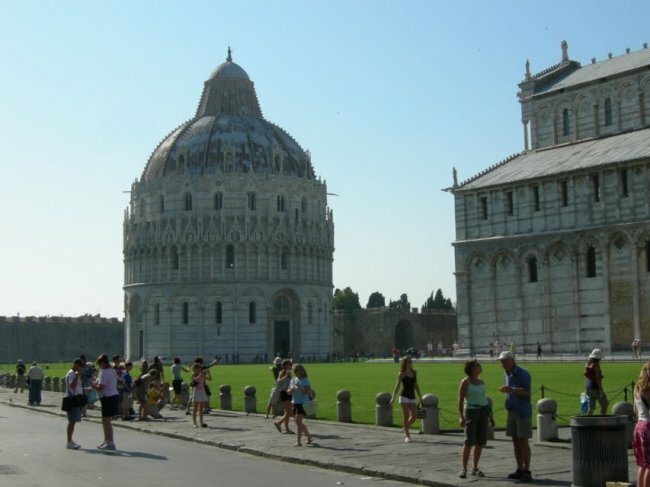 This small group Pisa walking tour will take you on a trip back in time to discover an era of great artistry, ambition and architectural genius, to a time when extravagant cathedrals were built and filled with richly coloured mosaic, and a time when even the wonkiest of towers can be counted as a ‘Wonder of the World'. And all this is the space of 60 minutes. During the tour your expert historian guide will lead you to the most important monuments of the city including the Piazza dei Miracoli, the Basilica della Santa Maria Assunta, the Baptistery and, of course, the Leaning Tower of Pisa. Marvel at the stunning facades as your guide talks you through the myths and facts, gaze in wonder at the interior of Pisa's Cathedral, and tilt your head to take in the impossible angle of the world-famous bell tower. This tour is ideal for people on a day trip to Pisa or with limited time in the city, you'll be able to see most of the city's highlights and get an overview of the history. Great for small groups and people wanting a more personal tour. Your Experience With Pisa Guided Walking Tour? Discover the marvellous Piazza dei Miracoli, visit the famous Duomo Cathedral and see the impressive Learning Tower. Learn about the city and its history in a compact 1-hour tour. Get real anecdotes and insider tips from your friendly local guide. What Pisa Guided Walking Tour Includes? If you want to go inside the Leaning Tower you could consider a 1.5-hour walking tour including Tower entrance or purchase a reserved time skip the line entrance ticket. Travelers Reviews about Pisa Guided Walking Tour? Traveller's on Viator and TripAdvisor have left 5-star reviews for this 1-hour city tour. Described as ‘very enjoyable', comments say that the tour is a great introduction to the city and run by excellent guides. Customers who purchased this with Get Your Guide have also pointed out that the tour is good for children and that the guide was open to answering any questions. Wheelchair users should be with an assistant if necessary. Ticket policy depends on your tour provider, charges will apply for cancellations made less than 7 days in advance (Viator) or 1 day in advance (Get Your Guide). You must bring your printed or mobile ticket. Entrance fees to the Baptistery, Cathedral, and Leaning Tower are not included in the ticket price. This tour will visit the Cathedral depending on the size of the queues. This tour is available in English, Italian, Spanish, German, or French and may be conducted in two languages. If there are less than 2 participants the tour will be cancelled and fully refunded. Departure from Central Pisa, please check booking confirmation and arrive 15 minutes in advance.